In the first season of the Munsters, Herman Munster, the family patriarch, loses his daily transportation in the episode “Hot Rod Herman”. Herman races the Koach at the dragstrip and loses--not only the race, but the car itself. Herman's Father-in-Law, Sam Dracula (better known as Grandpa Munster) comes to the rescue by designing and building his own car, making the body out of a casket. 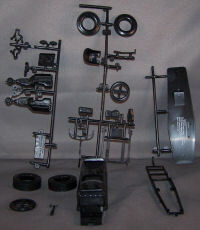 The Drag-u-La is molded in black and is a simplified kit (remember this is 60s tooling) with wire axles. The chassis is one-piece, but features a separate chrome front axle and radius rods. The engine has 14 pieces, including a unique chrome air scoop and chrome organ pipe headers. There is no interior, per se, but it does feature a unique drag racing type steering wheel, instrument panel, seat, shift lever and hand brake. The tires are black plastic and mount up to chrome plated mag wheels (rear) and chrome spoked wheels (front). The decals are minimal, but feature a spider web for the differential, the “Dragula” name in black or gold for the clear canopy, plus two different Drag-u-La decals for the tombstone. The only plating inaccuracy I see in the Drag-u-La is the headlamps—they should be brass toned. The Drag-u-La comes with a model of a self propelled surfboard and a rack you can mount to the Drag-u-La to carry it around on. The surfboard is shaped like the lid of a coffin. 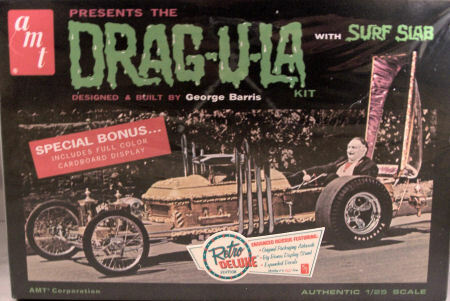 I built a Dragula as a kid—it is long gone, but I still have a few of it's parts in my storage bins, including the canopy. I'm looking forward to building it again, as a companion to my original Munster Koach. Thanks for Round 2 for persuading AMT to re-release this ghoulish duo. Seeing it again takes me back to my youth. My sincere thanks to Round2 Models for this review sample!